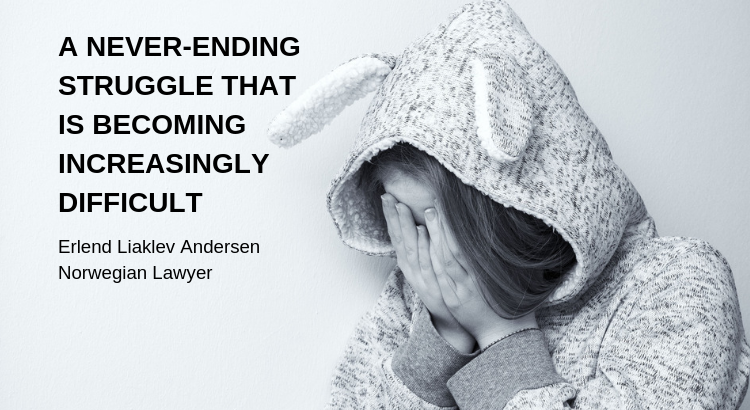 In his article “A never-ending struggle that is becoming increasingly difficult”, Norwegian lawyer, Erlend Liaklev Andersen encourages parents not to give up fighting for their children. Andersen recognises that Norway’s child welfare system, is a system of obstruction that only gets increasingly worse. “I have represented many parents who currently are or have been in an exhaustive battle with the child welfare system. I have been involved in many joyful moments of reunion with the return of overjoyed children to their parents, but still, all the devastating cases leave the strongest impression. All of those parents who have fought and fought for years, who do not give up the fight for the most important people in their lives, but who face a system that creates obstacles that only get bigger and bigger. Cases that may have started with a minimal concern, a false accusation, an anonymous concern, a misplaced comment, misunderstandings, misinterpretation, prejudice or slander, that ultimately end up becoming piles and piles of reports from meetings and observations, assessments, and medical journals. Once the fierce child welfare machinery has started, there is a snowball effect that rolls quickly and gains extensive weight in a very short time. A murky dynamic occurs. The child welfare services’ intervention is, through stress, pressure and prosecution, creating a situation where parents have to spend time and resources on everything else than what is most important, namely to be parents. This in turn provides the basis for new concerns and new arguments that can be used against the parents. After a round in the legal system, the stack of child welfare documents is often summarised in a decision that gives the arguments further weight and legitimacy. Experts have had their say, with the incorporated weaknesses and uncertainties, and the pile of documents has become even higher. The road ahead is steep and exhausting. After such a struggle, where the power balance is as uneven as it possibly gets, the parents who manage to stand upright and continue their fight, should be saluted. It’s an inspiring thing to be able to stand by your side, be with you in the fight and take part in all your ups and downs!